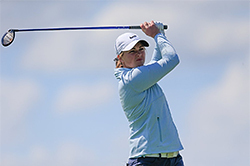 Recently turned professional, proud Scot Hannah (25), who was born in Aberdeen and raised in Strathspey, was one of Scotland’s leading amateur players, winning three consecutive Scottish Golf Ladies Order of Merit titles before transitioning to the pro ranks this year. Hannah joins fellow Scot and 1999 Open Champion, Paul Lawrie, as an ambassador, at a time when the award-winning 850-acre Perthshire estate prepares to celebrate the Centenary of its Top 100-ranked championship courses, The King’s and The Queen’s, designed by James Braid. Gleneagles will also host the 16th playing of The Solheim Cup, from September 9-15, the pinnacle of women’s professional golf, on the Jack Nicklaus-designed PGA Centenary Course. Hannah, who was previously a member at Gleneagles during her Sports Studies degree course at The University of Stirling, said: “I’m incredibly proud to be representing both Scotland and Gleneagles as a professional golfer. Gary Silcock, Director of Golf at Gleneagles, commented: “In a year when Gleneagles welcomes the biggest event in women’s golf to Perthshire, it seems fitting that we announce a new partnership with Hannah, one of Scotland’s female golfing talents of the future. 2018 marked Hannah’s standout season as an amateur, winning both The Welsh Ladies Open Strokeplay and its Irish equivalent just a week later. Hannah was part of the victorious team to represent Scotland at the Ladies Home Internationals in Ireland, and she also represented her country at the World Amateur Team Championships. Hannah will initially focus her tournament play on the Ladies European Tour Access Series, with the aim of progressing onto the main Ladies European Tour. She also continues to work with the SportScotland Institute of Sport and PGA personal coach, David Torrance. Picture caption: Gleneagles newly announced Golf Ambassador, Hannah McCook. An iconic country estate set beneath the beautiful Ochil Hills, The Gleneagles Hotel has been a luxury destination for nearly a century. Located just one hour from Glasgow and Edinburgh airports and with its own railway station, Gleneagles offers the perfect retreat for those looking for relaxation, fun and adventure. Three championship courses have established Gleneagles’ reputation as a golfer’s paradise but the hotel offers so much more than golf. The 850-acre estate epitomises the natural beauty for which Scotland is famed and offers guests a glorious playground of country pursuits and activities. Whether you come to fly a Harris’ Hawk, ride horses, play tennis, go off-roading, train gundogs, shoot game, fish, enjoy Michelin-starred dining, or relax in an award-winning spa, Gleneagles offers a world of unforgettable experiences.